Carte Hydro-Geo-Graphique des Indes Orientales en deca et au dela du Gange avec leur Archipel Dressee et assujettie aux Observations Astronomiques. 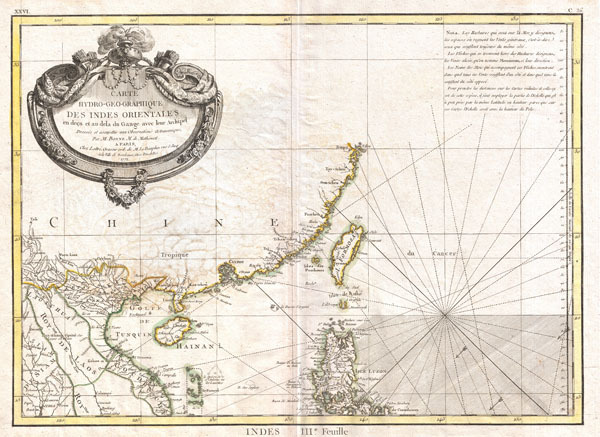 A beautiful example of Rigobert Bonne's 1771 uncommon map of southeastern China. Covers from the Kingdom of Siam (Thailand) to include Laos, Tonkin (northern Vietnam), Cochin Chi (southern Vietnam), the island of Hainan, Formosa (Taiwan) and the Island of Luzon (northern Philippines). Notes Macao and Canton and shows, but does not label, Hong Kong Island. Tayoan is noted on Formosa. Offers little inland detail with regard to China itself. Notes in the upper right hand corner comment on the Monsoons. Rhumb lines throughout. Arrows in the lower right show the direction of the prevailing winds. A fine map of the region. Drawn by R. Bonne in 1771 for issue as plate no. C 26 in Jean Lattre's 1776 issue of the Atlas Moderne. Very good condition. Original centerfold exhibits minor toning. Minor water stain north of Hainan near the word 'Tropique'. Blank on verso. Rumsey 2612.055. Phillips (Atlases) 664. National Maritime Museum, 215.